Calvin Klein will launch Euphoria Gold and Euphoria Gold for Men, a new duo of limited edition flankers to 2005's Euphoria and 2006's Euphoria for men. Euphoria Gold is not to be confused with the recently launched Liquid Gold Euphoria, currently exclusive to the Middle East. Euphoria Gold ~ a fruity floriental with apricot, kumquat, tangerine, honey, gardenia, daffodil, white patchouli, sandalwood and musks. In Eau de Parfum. Euphoria Gold for Men ~ an oriental fougère with ginger, lemon, cinnamon, honey, basil, amber, patchouli and vanilla. In Eau de Toilette. 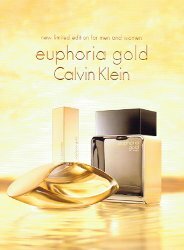 Calvin Klein Euphoria Gold and Euphoria Gold for men will be available in 100 ml. Daffodils smell horrible. The ones the Canadian Cancer Society sells every April do, anyway. I have to assume that it’s not a major component of the scent (or it’s a fantasy of what a daffodil might smell like). There aren’t enough oriental men’s scents, so I look forward to smelling this one. Oh, but there are several good narcissus fragrances…they don’t all smell bad. I don’t know what it smells like now but when it was new, Chloe Narcisse used to be FANTASTIC. And I somehow got to this point in my life without knowing that the narcissus and the daffodil and the jonquil were the same thing, or at least intimately related. Nevertheless, the standard yellow daffodil is not a pleasant thing to smell. In my experience. The mens sounds more interesting than the womens.